Back Row: Mr Derek Rule (Teacher), Nichola Green, Andrew Rosevear, Anneli Tremain, Susan Pearce, Donna Strout, Stuart Faulds, Kevin Tonkin, Maria Hilder, Maria Nicholls, Lisa Delbridge, Robert Hoskins, Stephanie Watkins, Elizabeth Fowkes. 3rd Row: Teresa James, Lucy Greenland, Maria Trevail, Karen Glasson, Unknown, Ivan Chandler, Maria Squance, Paul Finch, Jackie Foster, Susanne Strongman, Tracey Green, Sharon Opie. 2nd Row: Rachel Baker, Sally Strongman, Hamish Cameron, Julia Pascoe, Karen Brett, Jackey Bennetts, Simon King, Chris Brett, Richard Webster, Tracey Thomas, Sarah East. Front Row: Ian Crewes, Dione Brown, Susan Hoskings, James Bedowes, Karen Nicholls, Sarah Firbank, Danny Trevail, Nichola Penrose, Kevin Rice, Tracey Woods, Gary Hoskings, Maria James. 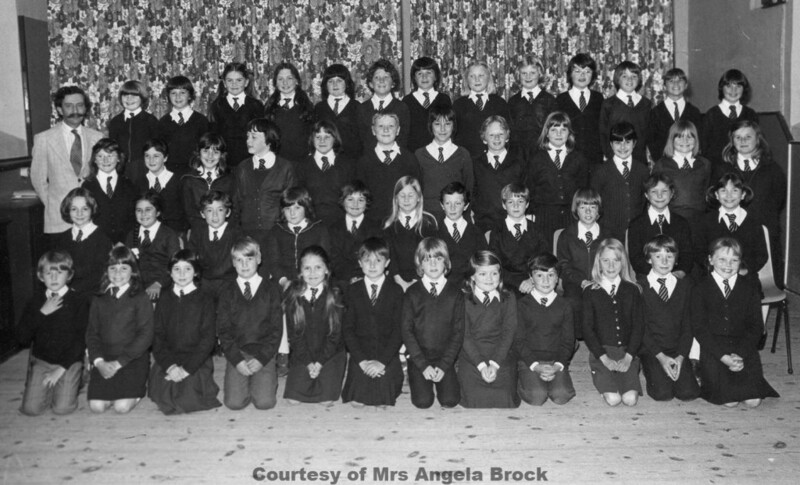 back row – end “Unknown” is me Elizabeth Fowkes. This was the school choir, and this picture was taken in the Sunday School room at the chapel just before a Christmas concert. As there’s nobody there from the year above me, it must be Christmas 1979. The girl to Paul Finch’s left is Jackie Foster, not Jodey Farer. On the end of that row is my cousin, SHARON Opie, not Shannon.